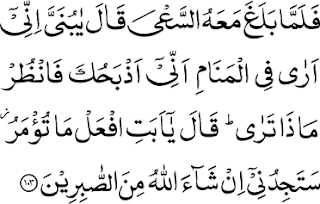 The Holy Quran affirms that it is a ‘Guide’, a ‘Direction’, only for the pious, the beneficent, the righteous. Not for others who are not pious or righteous, who do not put into practice what Allah says in the Holy Quran, (those) who read the Quran just like parrots, only on the lips and do not understand anything (of the Quran). For those people who are Muslims only in names, then the Holy Quran does not apply to these kinds of people. The righteous are those who already believe in the existence of God, although they cannot see Him, who already ‘raise and straighten’ the Salat, those who already observe fasting, already spend in the cause of God from among the goods granted to them, and they already believe in the truthfulness of the Quran and other scriptures revealed before the Quran (2: 3-5). What a wonderful perfection has Khatm-i-Risalat shown to the world! 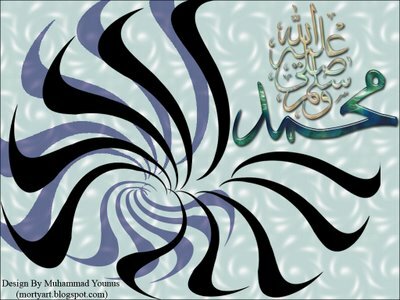 It has made the river of Nabuwwat (Prophethood) to flow in the Ummat. in comparison with the other Ummats. one has appeared among us as a Prophet? now possible among the Muslims, it is only on this account! In a recent series of conversations over e-mail, Ahmadi brothers of different denominational groups- Ahmadiyya Muslim Jamaat, Lahore Ahmadiyya Movement, Jamaat-e-Ahmadiyya (Haqiqi), Jamaat-e- Ahmadiyya Al Muslimeen and the Jamaat Ul Sahih Al Islam- shared their differing perceptions on the meaning and scope, ambit and purpose of the spiritual title of “Ummati-Nabi” as applicable to the Promised Massih (as). It is instructive to note that till the death of Khalifatul Massih Awwal Hadhrat Maulvi Hakkim Nur-ud-Din (ra) in March 1914, all Ahmadis, including those who went on to form the Lahore Ahmadiyya Movement (LAM) and unjustly ACCUSE Hadhrat Mirza Bashir-ud-Din Mahmud Ahmad (ra) of doctrinal revision, believed that the Promised Massih (as) was indeed a Nabi in the Ummat-e-Muhammadiyya. Yet, after the Great Split in the Jamaat, the Lahore Ahmadis indulged in doctrinal revisions to position themselves away from their own previous beliefs and proclamations. ( See the poem published in their Journal a month before the Split in March 1914). 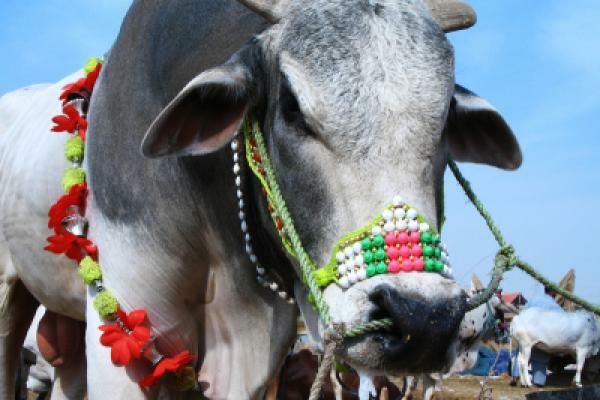 The spirit of Eid-ul-Adha ought to pervade the faith and practices of the believer in his everyday life. He could, should and would be ready to sacrifice all that he values and cherishes in furtherance of the cause of God and to fulfil His wishes. Being submissive to the command of God and the willingness to sacrifice in the Divine Path is a call of duty for all Muslims, to be discharged throughout their lives. It is through the practical demonstration of obedience to Divine commandments in their own everyday life that the believers will be able to inherit and follow in the footsteps of the noble Messengers and saints of the past, points out the Khalifatullah Hadhrat Munir Ahmad Azim Sahib (atba) of Mauritius, in his Friday Sermon of 18 October 2013. 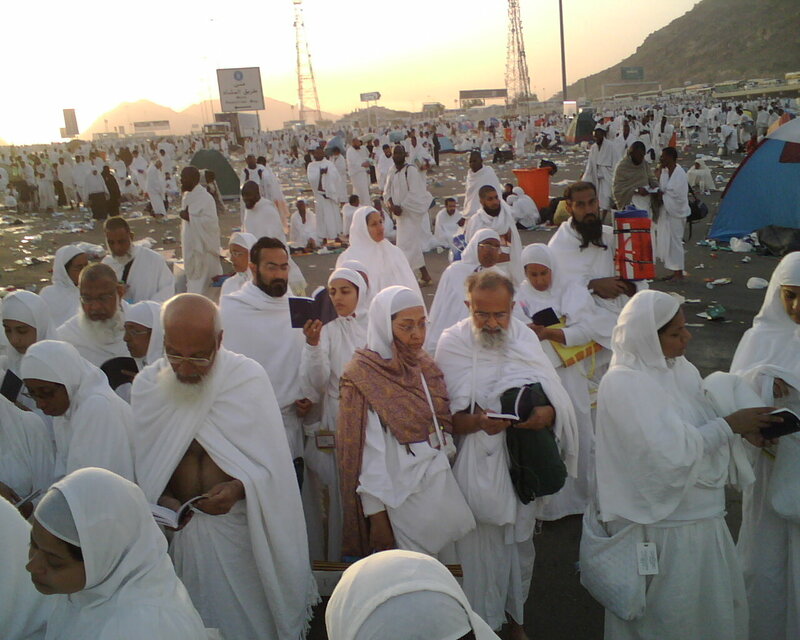 Performance of Hajj is one of the fundamental religious obligations of the Muslims. Yet, today Ahmadi Muslims are legally prohibited from enlisting themselves for the same, as the Ulema in Pakistan have succeeded in writing their bigotry and intolerance into legal injunctions. The Saudi Arabian authorities who take pride in the title of “Custodians of the Holy Mosques” have failed to estimate the gravity of their mistake in preventing those who believe in Allah (twa) and His Messenger from doing Hajj. The Kaaba, in the course of its several millennium of history, had witnessed some tragic transgressions, including the installation of idols and the taking away of the Black Stone itself for a period of time. 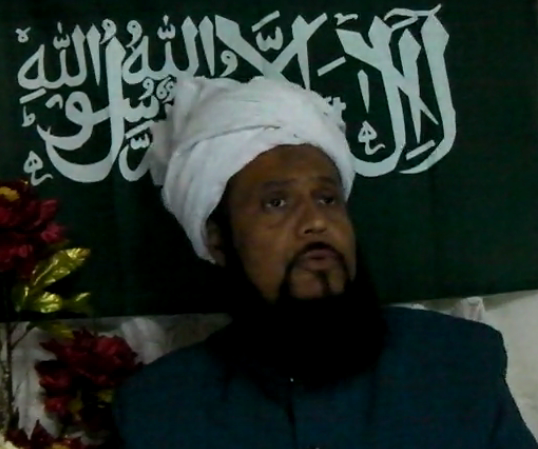 Allah the Most High has informed the Khalifatullah Hadhrat Munir Ahmad Azim Sahib (atba) of Mauritius that the present legal restrictions/ religious prohibitions would also be thrown into the dustbin of history as it unjustly prevent the Ahmadi Muslims from being able to perform the Hajj. Prophet Muhammad (peace be upon him) delivered his last sermon (Khutbah) on the ninth of Dhul Hijjah (12th and last month of the Islamic year), 10 years after Hijrah (migration from Makkah to Madinah) in the Uranah Valley of mount Arafat. His words were quite clear and concise and were directed to the entire humanity. Through his willingness to offer his son Hadhrat Ismail (as) in sacrifice, Hadhrat Ibrahim (as) displayed tremendous commitment and extraordinary faith in executing a Divine Command. Islam, thus, commends the sublime spirit of sacrifice for the sake of seeking the pleasure of Allah (swt) in its rituals and faith-practices. The festival of Eid-ul-Adha and the ritual of Qurbani integrated with it, in many ways, represent the permanent remembrance of Muslims of the great sacrifice of the Great Patriarch and Khalilullah. In his Friday Sermon of 11 October 2013 (05 Dhul-Hijjah 1434 Hijri), the Khalifatullah Hadhrat Munir Ahmad Azim Sahib (atba) of Mauritius continued the theme of the great sacrifice of Hadhrat Ibrahim (as) and underscored the significance of Qurbani or Udh-hiya on the occasion of Eid-ul-Adha. Therefore, when both father and son submitted to the will of Allah, then Allah Himself was extremely pleased with such a proof of love and submission which both His chosen servants showed towards Him. 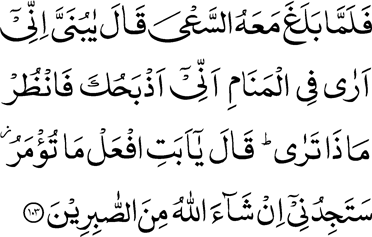 Hazrat Ibrahim (upon him be peace) offered the life of his son at the command of Allah the Almighty, but (then) Allah, the Exalted says: “Wa fadaynaahu bizibhin ‘aziim” (37: 108) - And We ransomed him with a great sacrifice. People practice different rituals in their quest for Divine satisfaction. Sincere good deeds and personal sacrifices made solely for the purpose of seeking the pleasure of Allah have special resonance at the throne of Allah (twa). In the quest for understanding the spirit of sacrifice in the service of Tawheed, the life of Hadhrat Ibrahim (as) serves as an enduring model and inspiration for all believers. For his experiences in all their complex and varied settings represent an extraordinary saga of submission to the Divine Will. 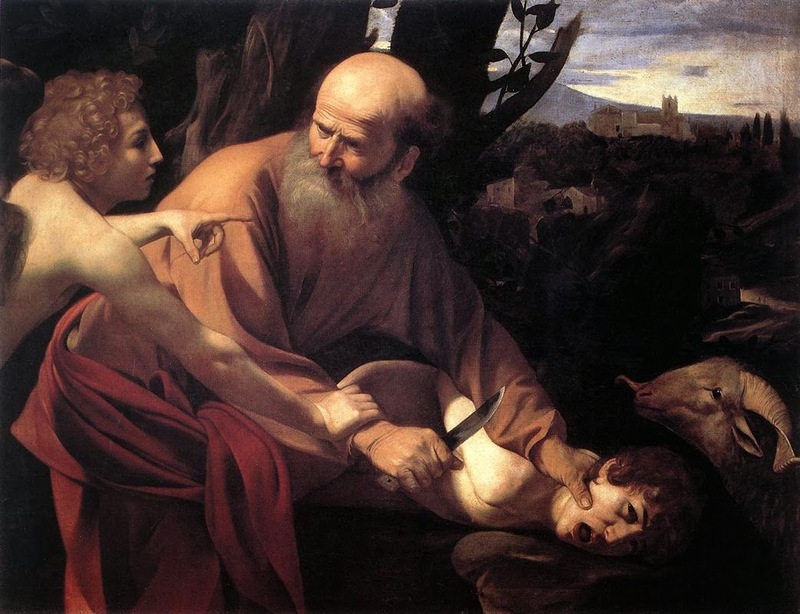 Even under conditions of severe trials, requiring extreme patience in the contingencies of life such as being asked his son, Hadhrat Ibrahim (as) remained sincere, solely devoted to the protective hands of the Divine [Inset: Artistic impression of that great sacrifice). 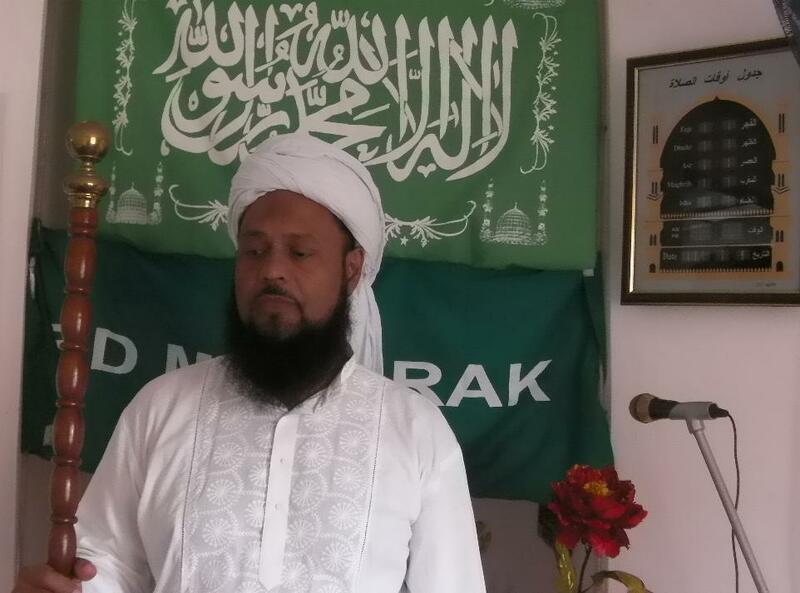 In his Friday Sermon of 04 October 2013, the Khalifatullah Hadhrat Munir Ahmad Azim Sahib (atba) Mauritius reflected on the purpose of Qurbani, a ritual of faith all devout Muslims observe on the occasion of the performance of Hajj / Eid-ul-Adha in the backdrop of the story of the life of Hadhrat Ibrahim (as). Islam envisions a world order of peace and brotherhood, celebration of linguistic, racial and cultural diversity, human equality and international solidarity, empathy and care for the less privileged. Yet today, Muslim Ummah everywhere seems to be under a siege from within and outside: economic upheaval, social turmoil, a loss of values, political unrest and even war among the brothers in many societies. The class of Mullahs have discredited their leadership with theologies of terror, obscurantism and formulaic rigidism, bereft of empathy and understanding for the complex circumstances of the Muslim peoples struggling to adjust with the ebb and flow of life. In his Friday Sermon of September 27, 2013 the Khalifatullah Hadhrat Munir Ahmad Azim Sahib (atba) of Mauritius profoundly underscored the need for serious reflection on the part of the Muslim Ummah in an age of multiple crises and Satanic trials afflicting the entire Ummah. It is for the Muslim Ummah to introspect on what goes wrong with their spiritual and material self. The promise of Divinely-inspired Khilafat in the form of the arrival of the Khalifatullah with the Holy Spirit has been astonishingly fulfilled in this age in the personhood of Hadhrat Munir Ahmad Azim Sahib (atba) of Mauritius. Yet the world of Islam is yet to awaken to this awe-inspiring spiritual development in our times. In the age of a Divine Messenger, trials and rewards await the believers; just as the Satanic impulses of the age will induce the people to deviate from their noble selves. 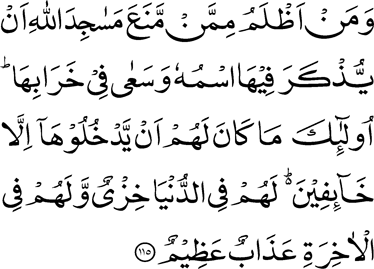 To defeat the army of Satan, the believers have to wage a war at all levels of consciousness and follow the true guidance which is the guidance of Allah (twa) being made available through His Khalifa.While the Satanic forces of the age may rejoice at the apparent dangers to the faith of Islam, Allah (twa) raises His own small army to register and record a model of Living Islam for all sincere, truth-seekers and Divine –worshippers.